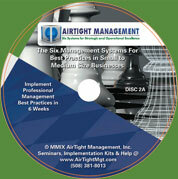 A complete complete training plan and package for your management team to begin using the Systems of the AirTight Management framework they need today. We will educate your staff to implement these best practices. This is for very small companies on a budget that do not mind the risk of working alone or have very experienced management teams who already know best practices. It is not recommended for most companies, companies over 15 employees, or companies with revenues over $2 million. On-site time means we will help you implement each System you need and be able to access and plan the implementation with you. Our experts will diagnose, evaluate team members and develop a custom plan for training and implementation. We will deliver the training and coach people through the process. Each engagement is customized to your needs, time frame and budget. 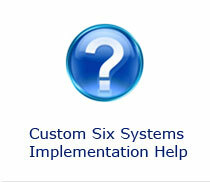 We can facilitate implementation of any System alone or several over time. Available coaching and support improves the speed of implementation and results. Training alone is high risk as people will gravitate back to old habits. Leadership must also participate and be trained. On-Site Implementation With Our Experts - Higher cost and lowest risk because we guarantee results. This is a complete full service process spread over months, or even a year or more for larger companies. Generally 6 to 8 weeks per system is recommended. Our experts will generally make one or two-day visits each month. For each system you require we will diagnose, design and implement all needed components including training, project management, oversight, reporting to leadership, employee evaluation and coaching to success. Obviously each engagement is custom designed and quoted with a three phase process: 1. Discovery, 2. Design, 3. Implementation. Then we support the team and coach them for 60-90 days afterwards until the systems become reflex and part of the culture and monthly cycles to create a higher-performance company and culture. Typically a full team training is usually about one and a half to two days per system for best results. This is best spread over the project as each of The Six Systems is implemented with two to three hours of training per visit. Often Systems #1 through #3 are implemented in two phases. If a company is ready to hit a growth surge we can speed this process up.